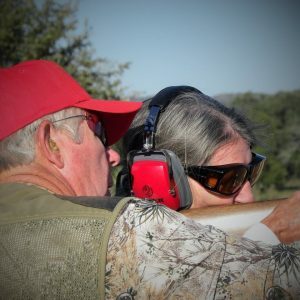 Thanks to a unique program from Texas Parks and Wildlife, women of all ages–who have never had the opportunity to camp, climb, fish, or sport shoot–are getting the chance to become the outdoor women they always dreamed of being. The Becoming and Outdoors Woman workshops span a weekend. They usually begin on a Friday at noon and lasting through Sunday noon. The weekend is divided into four sessions and attendees pick their own classes. learned to field dress harvested game. Participants come away from the weekends with the confidence to engage the outdoors in new ways. Moreover, they meet other women with similar interests, and make new friends. We just missed this year’s Becoming an Outdoors Woman Workshop. Even so, it is not too early to get on the list for next year. Visit the Texas Parks and Wildlife website to find out how to sign up. And while you’re there, you can check out other outdoor opportunities for you and the family. We record our series at the Block house and Joel Block engineers our program. You are currently browsing the Passport to Texas weblog archives for the day Wednesday, November 7th, 2018.